Mark Thatcher is one of the most experienced people in home shopping television in the United Kingdom. That’s because he’s been working at the forefront of the business for almost as long as there’s been selly telly in this country. Mark was educated at the University of Kent at Canterbury, from where he graduated in Radio, Film and Television. He started his career in the corporate sector. His talent quickly shone through and his 2nd production as director won an International Television Association award. He worked for prestigious clients including Pilkingtons, Cussons and British Aerospace. At the age of just 28, Mark founded the Television Business, and continued to thrive, working with such projects as the Venice-Simplon Orient Express, and winning a long-term contract to work in Saudi Arabia at a very senior level with the Saudi Royal family. On his return to the UK in 1993, Mark had the opportunity to work at QVC, who had launched in this country the previous year. Working in the new environment of live TV home shopping, as a freelance producer, again Mark stood out. After three years with QVC’s British operation, he was selected to help oversee the launch of QVC in Germany. Mark’s next major assignment was the launch of Ideal World in Peterborough, the UK’s first and largest home-grown shopping channel. He was responsible for the £18m design and build of the 72,000 square foot premises, and, following its launch in 2000, serving as Head of Broadcasting with 286 staff reporting to him. Ideal World suffered a catastrophic fire two years later, in which the entire building was destroyed. Mark managed to have the channel back on air in a remarkable six days. Since 2003, Mark has concentrated on producing pre-recorded content, and has continued to work with many of the major players in direct response television, including Vector Direct and JML. He has brought dozens of infomercials, spots and commercials to air, supplying just about every channel on the Sky platform that takes DRTV content. 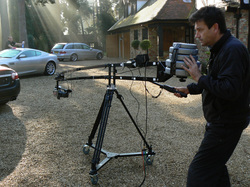 As well as occupying very senior roles, Mark is also highly skilled in most areas of TV production. Having had a passion for stills photography and video from an early age, Mark is an accomplished camera operator, and does spectacular jib work. In his teens, he worked in a recording studio, and cut his teeth in sound engineering techniques. Mark is also a very experienced and creative editor, having used Adobe Premiere and other packages for many years. Add all this on top of his extensive producing and directing work. Combine this range of skills, experience and Mark’s many contacts within the home shopping industry, and you can see that there really is no-one better to entrust your brand with. Being able to sell is a sought-after attribute. The ability to make engaging television depends on broad technical skills and creativity. Mark has all of these, and this is why the Television Business slogan is “making TV that makes sales”.